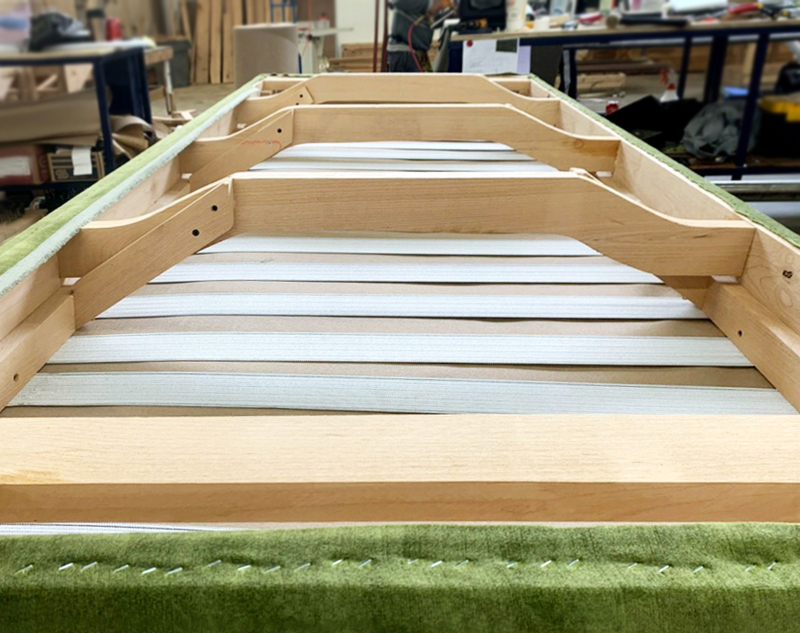 We begin construction of each our sofas using kiln dried alder frames. We do NOT use softwoods such as pine or particleboard. Our frames are warrantied for as long as you have your couch. If it ever starts creaking or cracking we will fix or replace it. We offer three different types of suspension: sinuous springs, 8 way hand tied coils and European style webbing with a lifetime warranty on each of them. Our seat cushions are made of commercial grade 2.4lb per cubic foot (PCF) Certipur polyurethane foam free of formaldehyde and PBDE flame retardants. This foam is referred to as high resiliency or HR foam. That's a technical term and refers to a specific class of product. If you read about "high-density" foam elsewhere be aware that high density is marketing language and has no real meaning. Industry standard is 1.8 PCF and the heavier the foam the more slowly is softens over time. For maximum longevity, we can use 5lb PCF latex for you seat cushions. After that, let the games begin. You can have alder, oak or walnut legs. Choose goose down or a hypoallergenic down-substitute called Trillium for your cushions. We can guide you through the differences between a sinuous spring suspension that most manufacturers use and the 8-way hand tied suspensions the high end brands use. We can show you a LOT of standard fabrics like you'd find at University Village, or if you're ready for luscious high end velvets or Italian linen-blends, we can show you those too. We have a baseline of good quality and with our knowledge and options, we are uniquely equipped to offer you great quality while giving you full transparency into the difference. We also have the capacity to build with all natural latex, wool batting and even 100% organic cotton, wool, and linen fabric if you are looking for a natural, chemical free couch. You can learn more about these options here on our Eco-friendly page.